The RIDGE now comes with the super lightweight, incredibly compact Snowpulse 3.0 Inflation Technology. 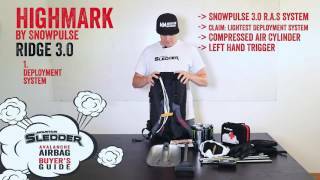 This is Snowpulse’s lightest airbag system of all time and weighs less than 1 liter of water. The RIDGE was designed to meet the needs of snowmobilers who demanded an intelligently-designed, compact and low-profile avalanche airbag.